Perched high above Toiny, Enzuma is a true haven for families who want tons of privacy, comfort, and a sweeping view of the sea. I love this villa’s simple luxury and gorgeous views. Parents can stay in the master bedroom on one side of the villa, while children stay in the bedrooms on the opposite side of the villa. You’ll find relaxation and serenity in this peaceful villa. Fantastic outdoor deck and back yard areas with a beautiful pool! Enzuma villa is located in Toiny, a quiet, peaceful region perfect for relaxation. This villa is modern and private, with gorgeous views of wild Toiny Bay. The backyard is perfect for lounging. Guests can recline in the hammock, float in the infinity pool, or sunbathe on the day bed. An exterior dining and sitting area sits under the covered porch, with a gas BBQ for al fresco feasts. Steps lead from the deck down to a grassy lawn that slopes down the hillside. Inside, the spacious and chic living area has a flat screen TV, large sectional, and sliding glass doors that lead to the deck. The nearby dining table seats four, and the kitchen has two bar-tops for additional dining or prep space. Sleek cabinetry, modern appliances, and minimal decor makes cooking easy and convenient. All three bedroom suites are under the same roof, great for a family vacation with little ones. Each has a floor-to-ceiling view and air-conditioning. The master bedroom has access to the pool terrace and private rear patio, with an ensuite bathroom and queen-sized bed. On the other side of the living room, there are two more bedrooms that share a bathroom across the hall. One has a queen-sized bed and would be perfect for children, while the other has a king-sized bed, a shower, and sink. 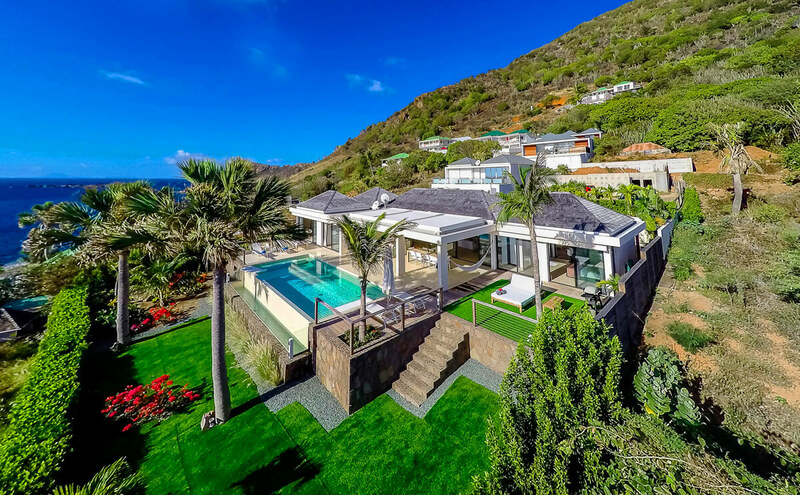 Enzuma villa is a half hour drive to Gustavia and less than 10 minutes from Grand Cul de Sac Beach. The Hotel Le Toiny and its high-end restaurant is nearby, and more restaurants can be found 10 minutes away. One spa treatment at the villa for one person, a bottle of Champagne, and a cheese and charcuterie board.